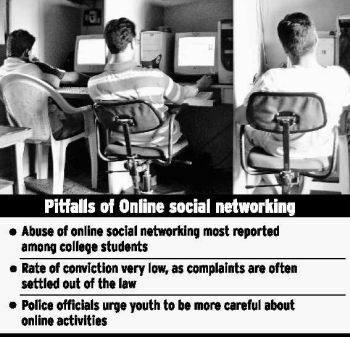 Abuse of social networking sites misused among youth in Kochi ! while engaging in online social networking sites seemed to have yielded little results, if the statistics and current trends are any indication. The Cyber Cell of the City Police has received more than 40 complaints of abuse of social networking sites like Orkut and Facebook this year itself. In one such case reported last month, a student union leader of a leading college in the city complained of someone making a fake profile of his on Facebook and inviting friends. The fake identity was circulated among the original friend list, along with the message that the original identity has been hacked. The complainant lodged the petition when the suspect also started making pestering calls to his mobile phone and threatened to make complicate things if any attempt was made to stop him. The suspect was tracked to Saudi Arabia, where he was operating a ‘rent-a-car' service. Since none of the immediate relatives of the suspect were available at the home address at Thalassery, the police could not make any progress beyond this. The Cyber Cell is now taking steps to delete the fake profile from cyber space. The standard procedure in these cases is that the cyber wing of the Interpol will be alerted, from where the details of the case will be moved to the police agency concerned. The suspect can thus be tracked to where he is situated and arrested, said K.J. Francis Pereira, sub-inspector, Cyber Cell. Usually, it will take a maximum of 10 days to track the Internet Protocol (IP) address of suspects. The City Police also have established direct links with cyber wings in many countries. This has been achieved as the City Police have been convening international conferences on cyber crime regularly, thus having more interaction with their counterparts. However, the police are facing a major stumbling block in pursuing complaints of cyber abuse to a logical conclusion. The number of cases being registered out of petitions remain much less, as suspects often turn out to be college students – and in a majority of cases known to the complainant. The first time offenders of abusing social networking could be charged under Section 66 (c) of the IT Act and fetch them five years' imprisonment and fine of up to Rs. 10 lakh. If the suspect is convicted of spreading obscene content also, this could be hiked to seven years' imprisonment. This makes many complainants agreeing for compromise on apologies tendered by the suspects. A conviction could have served as deterrent for most of the first-time offenders, who mostly do it without knowing about the seriousness of the crime. At present most of the complaints are about hacking of passwords and posting fake profiles using photographs copied from original profiles. All attempts to warn students about liberally posting their personal details and photographs on the networking sites are ignored, said Vinayakumaran, Assistant Commissioner of Police, Hi-Tech Cell of the Kerala Police. This has not taken the steam out of the awareness drive by the police, though. The Cyber Cell of the City Police have covered almost all college campuses in their limit at least once, and even to those outside the city limits, to make students aware about the dangers involved in careless cyber activities.